Brownfields are abandoned or underused properties with real or perceived contamination. Estimates from the U.S. EPA have put the number of brownfields nationwide at more than 400,000, with Wisconsin home to more than 5,000 brownfield sites. 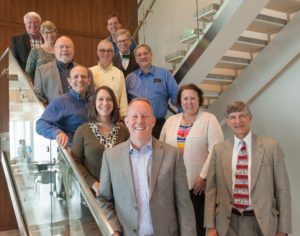 Study Group members recently celebrated the group’s 20th Anniversary during a meeting in Milwaukee. Pictured clockwise from front left are: Dave Misky, Karen Dettmer, Bruce Keyes, John Stibal, Nancy Frank, Scott Wilson, Geoff Siemering, Art Harrington, Sam Tobias, John Antaramian, Lynn Morgan and Mark Thimke. With an eye toward cleaning up those properties and returning them to productive use, the State Legislature and Gov. Tommy Thompson created the Brownfields Study Group in 1998. The task force was charged with evaluating Wisconsin’s brownfield programs and recommending changes, as well as proposing new financial, policy and liability incentives. Thirty of the Study Group’s initial recommendations were adopted, and based on that initial success the Study Group continued to meet and provide input on brownfield issues. Wisconsin Plant Recovery Initiative – an Environmental Council of States award winner for innovation, this program helps businesses and communities turn around closed or closing manufacturing facilities. Since the passage of Wisconsin’s Land Recycling Act in 1994, more than 18,700 acres of rural and urban land has been cleaned up. The Study Group has not only received national attention as a stakeholder model but has spurred the formation of similar DNR groups for work on air, waste and petroleum issues. The Study Group meets three or four times each year; the next meeting will occur in the early fall of 2018. Meetings are open to the public. If you’d like to be notified of future meetings, please send an email to Michael.Skwarok@wisconsin.gov to be added to a Study Group-specific email list.